"Improve Education network security: Consideration and Best Practices"
Education network security is highly essential. Why is education network security so important? With increasing threats to education network security, it is imperative that school districts implement stringent security practices to protect their students, staff members, and networks from virtual intruders. Security incidents are inevitable and that it is not a matter of if, but when an incident will occur. So, how can you improve the school district network security? Developing a comprehensive, district-wide network security strategy calls for adopting a cross-functional team approach. Every department should be engaged in the safe and secure operations of a school district network as every department is at risk. What common threats are education networks facing and where are they most vulnerable? 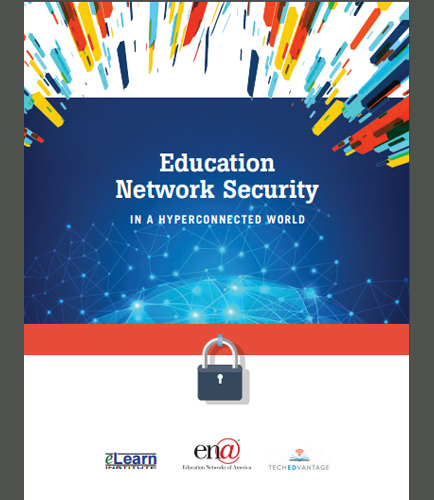 This white paper provides an insight into potential network security threats impacting today’s education network. It also shares key considerations and best practices every school district can implement for improving their network security as well as preparedness when an incident does occur. Incident Response Plan and Mitigation Strategies. Download this white paper now as it provides the district technology staff with the blueprint they need to create an effective and impactful approach to safeguarding their network security.